Citizen journalists beware: There’s a new Android smartphone in town that’s slim, powerful and downright cheap and comes from a company you may not have even known was making smartphones: Asus. Asus Zenfone 2 Android 5.0 smartphone. At a crowded New York press conference Monday, Asus, better known for its PCs and tablets, showed off the new 5.-5-inch Asus Zenfone 2 Android 5.0 smartphone–a unit with plenty of photo and video features amateur and professional journalists and social media mavens might appreciate. And its phone and data features aren’t bad either. Not only does the Zenfone 2 come with a powerful Intel Atom processor, a high-quality 13MP PixelMaster camera and sophisticated low-light technology, but it also comes with something one might not expect from an unlocked smartphone: an attractive price. At $299 for an unlocked Zenfone 2 with 4GB of internal RAM, 64GB of storage and a 2.3 GHz quad-core Intel Atom Z3580 processor or $199 for one with 2MB of RAM, 16GB of storage and a 1.8 GHz Atom Z3560 processor, the Zenfone 2 is significantly cheaper than unlocked flagship smartphones like the Apple iPhone 6 Plus, Samsung Galaxy S6 and the LG G4. Asus Zenfone 2 colors and finishes. At 4GB of RAM, the $299 Zenfone 2 also has more built-in memory for running programs than the iPhone 6 Plus, which gets away with 1GB of RAM by running memory-effiicient iOS 8, and Android phones like the Samsung Galaxy S6 (3GB) and LG G4 (3GB). The slim Zenfone 2 has a 1920-by-1,080-pixel 5.5-inch display and a 13MP rear camera which can—with a little software magic—capture 52MP images. The camera’s F2.0 lens, combined with special low-light and backlight modes, make it possible to capture clear images dark conditions without turning on the flash. Asus Lolliflash external LED flash. Speaking of flash, a cute, but useful photo accessory is the Asus Lolliflash, a small, bright LED light that pops into the headset jack and provides additional lighting for nearby objects. Also notable is the Zenfone 2’s fast charger, which switches between a fast-charging 9-volt, 2-amp mode to a standard 5-volt, 2-amp mode as needed. With the charger, a 10-minute charge provides 4 hours of 2G talk time or 2.7 hours of 3G talk time, according to Asus. 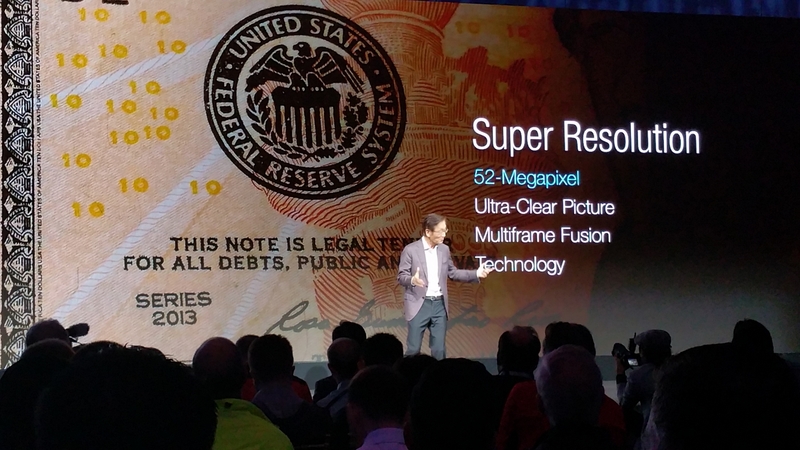 Asus Chairman Jonney Shih touts Zenfone 2’s Super Resolution mode. The Zenfone 2 can handle two active SIM cards at the same time—a useful feature for overseas travelers. One SIM can handle up to 4G data speeds while the second card handles only 2G data speeds. 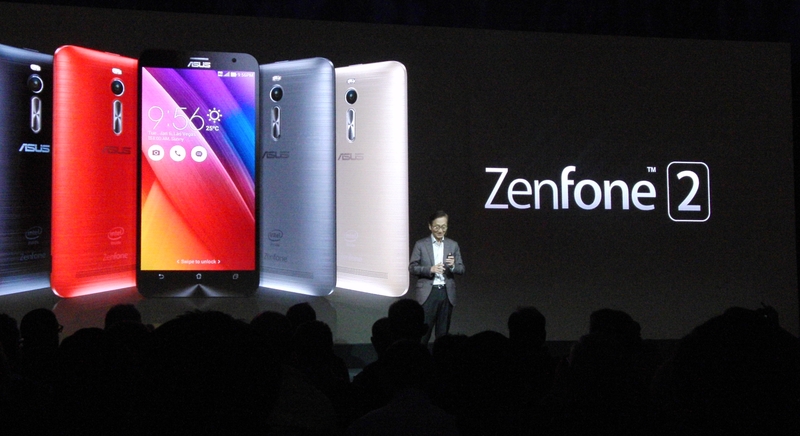 ASUS Chairman Jonney Shih introduces Zenfone 2 to New York media. Asus Chairman Jonney Shih, who hosted the press event, said the Zenfone 2 was well-suited for impatient, get-it-done-now New Yorkers. The Zenfone 2 went on sale Tuesday at numerous online and retail outlets. Second photo courtesy of Asus. This entry was posted in asus, zenfone and tagged android, apple, Asus, cell, cell phone, lolliflash, smartphone, travel, Zenfone, Zenfone2. Bookmark the permalink.